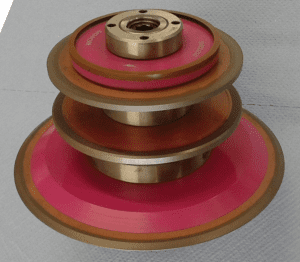 Polyimide Bond Resin Wheels | Action SuperAbrasives, Inc.
Polyimide is a high-temperature resin, manufactured in very much the same way as standard resin bond with the pressing temperature about three times that of resin bond and pressing forces as much as 5 times. Our resin wheels offer superior thermal superiority over regular resin bonds giving enhanced grinding performance providing excellent form holding making them the best bond choice for CNC grinders. They also offer lower power requirement translating into the ability to achieve higher material removal rates. Dressing these wheels can be difficult and ASA recommends dressing them wet. Generally, the poly product is manufactured up to 14” in diameter.